This picture was taken right after a rain storn when the clouds started to break, allowing the sun to shine in a unique moment that had to be captured! 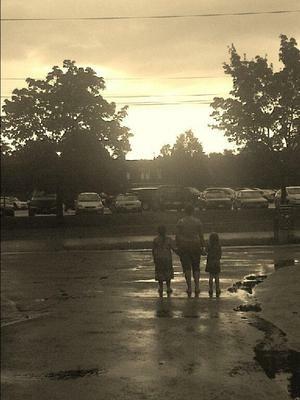 When we turned to take the picture, my niece (the middle one) had been playing with friends kids and just by coincidence, they had stopped to looked up at the sky, allowing us to take this absolutely beautiful picture which is worth sharing with everyone!!! Perfect photo-op that will forever be called "COMPLETE INNOCENCE AND PEACE"
Join in and write your own page! It's easy to do. How? Simply click here to return to Proudly Canadian Photo Contest.